The year 2017 has been one of the most exciting years for developers and technology lovers. Technologies such as big data, machine learning, Internet of Things (IoT), artificial intelligence, drones, autonomous vehicles, wearables, virtual reality, and smart homes are some of the fastest growing innovations. The year 2017 has been one of the most exciting years for developers and technology lovers. Technologies such as big data, machine learning, Internet of Things (IoT), artificial intelligence, drones, autonomous vehicles, wearables, virtual reality, and smart homes are some of the fastest-growing innovations. 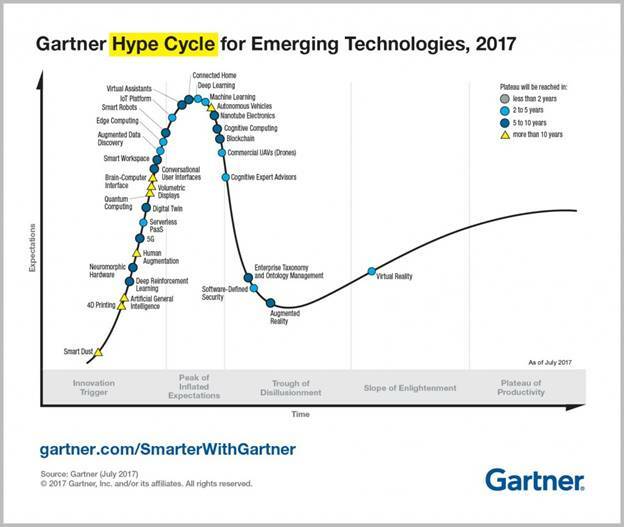 Gartner breaks down in its hype cycle of emerging technologies of 2017 and shows that AI, machine learning and deep learning are the focus while autonomous vehicles, virtual assistants, computer security, blockchain and cognitive computing is on the rise. The below graph indicates the lifetime of various technologies. In this article, I will focus on the cutting-edge technologies that are directly related to jobs and expected to grow at a faster pace than previously anticipated. Cloud computing has grown tremendously in the past few years and it will continue to rise in 2018. Let’s look at some of the numbers. Amazon’s AWS, Microsoft’s Azure, and Google Cloud take the top 3 spots in the cloud space followed by IBM and Oracle. Cloud jobs will continue to grow in 2018. The quarterly growth of Azure, Google Cloud, and AWS was 93%, 50%, and 45% respectively. The cloud migration and digitation transformation will continue to grow and so will the number of jobs. The digital transformation market size is $1.7 trillion for the next several years. Today, cloud architect is one of the most in-demand jobs. An Indeed search returns over 25,000 results for cloud architect keywords. The number of job results for AWS and Azure are over 25,000 and 12,000 respectively. Ransomware damage costs are close to $5 billion in 2017. Cyber security products and services are predicted to exceed $1 trillion over next 5 years, by 2021. Cybercrime will have a deficit of 3.5 million cyber security experts by 2021. 6 billion people will be affected by cybercrimes by 2022. Network engineers should start focusing on cyber security products and services. 1 million cyber security experts needed by 2020. If you’re looking for a growing career, cyber security will be one of the fastest growing fields for IT developers and administrators. Smart home speakers are growing and tens of millions of Alexa devices were sold during this holiday season. According to a canalys.com, Smart speakers are the fastest growing consumer tech, surpassing AR, VR, and wearables and shipments are expected to surpass 50 million devices. Smart home speakers are powered by an AI assistant. For example, Amazon Echo, Google Home, and Harman Kardon Invoke speakers are powered by Alexa, OK Google, and Microsoft Cortana respectively. Amazon Alexa is the AI-assistant behind tens of millions of devices like the Amazon Echo, Echo Dot, and Echo Show. Alexa provides capabilities, or skills, that enable customers to create a more personalized experience. There are now more than 25,000 skills from companies such as Starbucks, Uber, and Capital One as well as other innovative designers and developers. Over 25 millions Alexa Echo devices sold in Q4 2017. Today, 40% of adults use voice search and Apple’s Siri is used by 41.4 million monthly. Microsoft Cortana, the intelligent assistant on Windows 10 has 133 million monthly users. The numbers are expected to grow a lot. According to a research, by 2020, 30% of searches will be done without a screen. Smart home devices in the USA are expected to grow to 244 million by 2022. Here are some of the statistics on AI-Assistants. Smart home devices in US will be 244 million by 2022, up from 24 million in 2016. Six point three million will have at least one smart speaker by 2022. The rise of the need for smart home speakers and other smart home devices will increase the need of AI-assistant developers. If you’re a developer and looking for some exciting future opportunities, AI skills development will be something I recommend. Alexa skills developer demand will grow. As of now, there are 1000+ jobs available for Alexa developers. Augmented reality is one of the most sought-after technologies of 2017 and the demand will continue to grow in 2018. Major technology companies including Microsoft, Facebook, Google, Intel, Nvidia and others are working on their own version of AR/VR products. More and more AR-VR devices are being introduced to the market almost every few months. The gaming industry is already enjoying a huge success of VR and AR technologies. 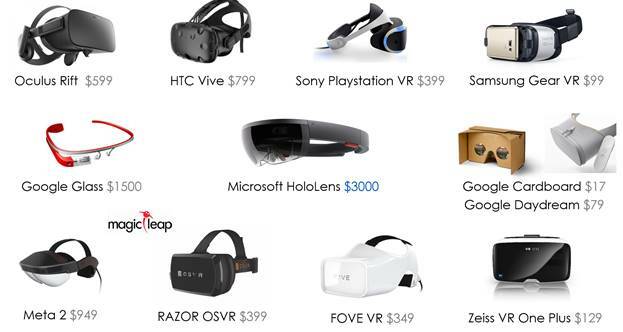 Oculus, HTC, Sony, Microsoft, Google, and Samsung are already selling thousands of devices worldwide. Facebook and a few other companies have a need for 10,000 AR/VR developers and content creators. 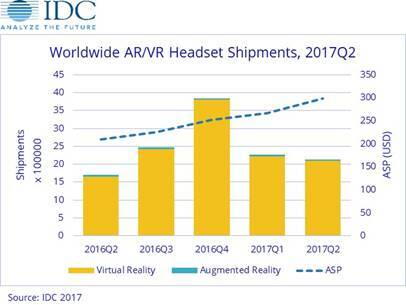 AR/VR market size is going to hit $162B by 2020 according to IDC and software is still playing a catchup game with hardware. There is a lack of experts and content for both, AR and VR devices. Here is a shipment report for the last few quarters. Augmented Reality is the future of telecommunication. Microsoft HoloLens has enjoyed a limited success in the mixed reality space and it is just getting started. In June 2017, Apple launched ARKit for iOS that allows developers to build augmented reality applications and games. Today, there are thousands of AR games available in Apple Store. Recently, Google announced its ARCore Developer Preview 2, that will let Android developers build AR apps for Android devices. Blockchain is the technology of 2017. You may thank bitcoin, altcoins (cryptocurrency), and ICOs (Initial Coin Offering) for the rise of blockchain. Thousands of projects have already been built on top of blockchain and more projects are being created every day. Check out Bitcoin Explained In Simple Terms to learn more about bitcoin. The following chart shows the Google Trends of for blockchain (blue), cryptocurrency (yellow) and bitcoin (red). Banking, payments, supply chain, insurance, security, and healthcare are a few industries that have already stated building blockchain based applications. As a matter of fact, 57% of large corporations are considering some kind of blockchain adoption. Obviously, this will lead to more jobs. There may not be too many jobs today but going forward, 2018 and beyond will have a major need for blockchain developers. 6 out of 10 CIOs are looking into blockchain. The year 2017 has been a remarkable year for technology growth and it will continue to grow. In this article, I covered 5 trending technologies that developers will enjoy in 2018 and beyond. Cloud and cyber security are the needs of today and tomorrow and it will continue to grow. AI-assisted home devices are growing and hence the need for software. Augmented reality and blockchain are two new growing technologies that will reshape the future in coming years. Besides these top 5 trends, machine learning, data scientists, data analytics, DevOps, and gaming are another growing trend you may want to keep an eye. Let’s talk DevOps.